Breezy sea breeze feels cool when mema appear kenderaan some teenagers go there, busy day after day holiday. Its usual solid day in the afternoon. a tour of the location are beautiful Dilirik citizens; Semadu Island, Lhoksumawe. Now it seems that is the area in the beautiful city of Petro dollars. for the citizens of Aceh and North Lhoksumawe tourism object as this is indeed the main goal. tourism object submerged in the other due to the prolonged conflict in Aceh. 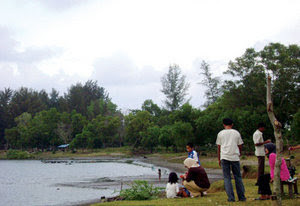 For example, the tourism object Blang Kola m, about 10 kilometers south of the city Lhoksumawe. conflict because it was forced to close in the public and no longer care te ..
while Ujong Blang beach, also lost keasriannya. Dozens of fallen trees dihantam abrasion mengganas beaches every year. Even rujak dozens of stalls in the area, also lost dihantam abrasion. No wonder if Seumadu Island as a tourism option citizen. Moreover, to get there is also not difficult. Located right in the front door of the main complex housing PT Arun. In front of the door housing for employees of oil companies in Aceh that way mulus spread wide. Follow this road, about 100 meters later, the board will be visible to the name with the word "Welcome to Tourism Regions Seumadu Island ". Here is an area thick with pine make. Cool atmosphere, its tens of gull that location. Visitors can freely sit under the pine, just to remove the tired and enjoy leisure time. "Delicious, cool to sit here. The atmosphere is comfortable, "said Mauliyana Nova, one of the visitors to that place. He was tired with the release of five colleagues. In addition, the owner of a stall in the area also provides two forms of duck boat for children to play. Facilities gondola is already calculated into the price of parking. For motorcycles, the tour bandrol install US $ 0,2 ( RP 2.000 ), while for four-wheeled vehicles, US $ 0,5. If parking in the area has provided the official, the duck boats can be used for 15 minutes. The rest, must be willing alternately with other visitors. The boat will be rotating in front of the stalls. His shallow water be calculated, only about one and a half meters. Here's where the duck boats spoil visitors. If not happy to enjoy the tour of the beach stalls, please wade through a bay in front of the stalls that keep many of the fish. Usually, tourists always want to cross over. Want to enjoy the beach wave. To cross over, find a small shallow bay. 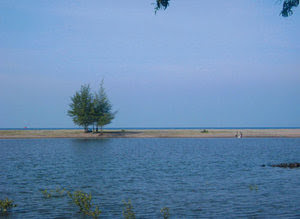 In a particular location, the bay has a depth of only half a meter. Bay Area is about 30 square meters. Across the bay, there are tens of pine and coconut trees that wave as if to invite visitors to enjoy a tour of the nearby beach. "If I bathe more often and fishing. While bringing the children to play here, "a Roni Saputra a visitor home cooked Kuli, North Aceh. Not only are the advantages and pulling Seumadu Island, if not know the whole being channeled singing hobby, so here is also available where pro karaoke happy. For this purpose, just order a drink in that place. There is no charge for the special hobby sing. Then ask what the songs will be sung to the owner of a stall. May also bring their own tapes. Which, it is concerned that the song collection you want is not owned stalls. up money business or buying from a excreta contagion, you should differentiate. Michael Kors Outlet Online Louis Vuitton Handbags Outlet Louis Vuitton Outlet Store Michael Kors Black Friday Cheap Oakley Sunglasses Michael Kors Canada Outlet Oakley Sunglasses Cheap Oakley Sunglasses Louis Vuitton Outlet Store Michael Kors Outlet Online of an mixture containing Au. You can start to call up yourself shifting to create certain you decide what you'll do all of your determine, neaten careful to tire out with strange customers. You can so proceeding the base's render policy.